Generic Top Level Domains are something new in the Internet, and in the past couple of years, there has been a surge in the number of gTLDs and over 1700 new gTLDs have been introduced in the domain marketplace. That is huge, considering that each of the gTLD gives the end customer to create a new domain name, and thus there is no limit. When the Internet and the web world was still in its early stages, there were very few TLDs, i.e. the suffix to domain names, and these include .com, .net, .org, etc. Now, there has been a huge increase in these TLDs, and you get to see domains for specific purposes, specific countries and for specific professions. Before we get into the topic about businesses and what these gTLDs mean to them, let us what you can do with gTLDs – Here, you are not limited to just .com or .net or those few options, and now you can register a domain that ends with even .travel, .museum or even .dentist based on what you need. There are advantages and disadvantages of using these gTLDs rather than the standard .com or such TLDs. Will the new gTLDs help the businesses? To start off, because the Internet is not used by more than quarter percentage of population in the world, there is a lot of scope in the near future. 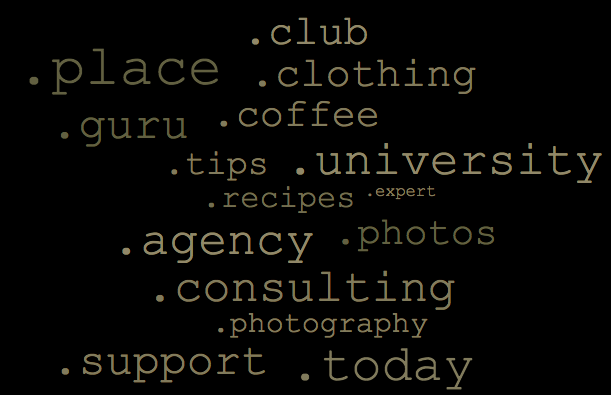 Thus, although these gTLDs for now aren’t much famous, they will hold their own value in the coming days. For now, I don’t see these as either an asset, or as a threat to the large companies who are running their businesses online. There are several reasons for this. Keyboard shortcuts and type-in domains are still those .com ones and people with little knowledge about the Internet, are going to just type in xxxaaadomain.com instead of any other extension unless they are specifically told that it isn’t dot com, and that is rather going to give a hard time to the companies if they are concentrating on the other gTLDs for now. The online presence of the brands won’t really look good at least for the coming few years if they are seriously considering the usage of these new gTLDs, because branding with such domain extensions won’t be easy at all, both in search as well as in marketing. For example, bendthetoys.com (just a random name) will still easily sit into the customer’s mind if he is not an avid user of the Internet, than using something like bendthetoys.store as many people still do not know about these gTLDs, and might even ask – how do I end this? with a .com after .store? Consumers are slow adapters to changes not just online but also offline, thus the companies would be wise enough to not make a big shift from the standard TLDs to the new gTLDs. But at the same time, if there are large businesses who are trying to establish their presence online, registering and keeping the domains with them won’t hurt much, at least with the redirection to the main website, until we see the Internet space actually adapting to these new domain extensions and using them with ease. It is also being said (and I cannot vouch for it) that these new generic TLDs are not going to get the same search engine value as the .com and such domain name extensions get, thus there is no reason why established businesses would use these rather than the standard TLDs. The generic TLDs are going to solve a purpose in the future, though. If you are looking for a photographer for your wedding shoots, there’s maximum possibility for the .photography website of someone to have their portfolio and the details you wanted. The domains would be sticking to specific niches. Right now, the domains ending with .com .net or .org are for everyone to use, either as a blog, a portfolio, an eCommerce store or a static website with nothing much. You might search for “Roses” which could be either a good coffee lounge or even a salon. The new domain extensions will give an option to such businesses to set up the website under .salon or such extension for easy differentiation. There are even better examples, but I hope you already got the point. Thus although you see the new gTLDs coming into existence in the past couple of years and not getting the fame already, one cannot write them off easily. There’s a long way to go, and these gTLDs will serve the way they are intended to do so, getting equal importance from both, businesses and the end users. Being a dentist, I’d love to use the .dentist extension for my website domain, but right now I’d be just confusing my patients with such a domain and they might even end up thinking that it isn’t a website address but a Skype ID I mentioned on the business card. But in the future, this domain extension might be something people might directly type in, when they see these marketed well, so good for me if I register the domain I desire to use and keep it with me, than lose it and regret later. .com and such domain extensions will still be the easiest to market, rank and share, but the new ones are going to have a good hold in the coming future, as the Internet is growing at a fast pace. Having said all this, even the domain name registrars right now aren’t offering all the new gTLDs and there are limited options for users, thus the trust factor is less because someone with limited knowledge about domains and hosting won’t like scattered buying (domains at different places) and thus, will wait to see when these registrars allow buying most of the extensions.